This article is about the U.S.-based supermarket corporation. For other uses, see Safeway (disambiguation). April 1915 (104 years ago) (1915-04) in American Falls, Idaho, U.S.
Safeway, Inc., is an American supermarket chain founded in 1915 by Marion Barton Skaggs. It is a subsidiary of Albertsons after being acquired by private equity investors led by Cerberus Capital Management in January 2015. Safeway's primary base of operations is in the western and central United States,  with some stores located in the Mid-Atlantic region of the Eastern Seaboard. The subsidiary is headquartered in Pleasanton, Alameda County, California, with its parent company headquartered in Boise, Idaho. Safeway stores operate under the logo of a stylized white "S" inside a rounded red square with the slogan "Ingredients for life". Following the organics trend, the stores have expanded the number of organic fruits and vegetables in the produce section and offer other items under the "O Organics" label. Stores may have a deli counter, a meat department, a produce section, a flower department, a bakery, a pharmacy, a liquor section, and/or many aisles of nonperishable items. The stores offer many in-house private label brands as well as name brands across all product categories. The original slogan was "an admonition and an invitation" to "Drive the Safeway; buy the Safeway". The point of the name was that the grocery operated on a cash-and-carry basis — it did not offer credit, as grocers traditionally had done. It was the "safe way" to buy because a family could not get into debt via its grocery bill (as many families did at the time, especially during the Great Depression). In 1926, Charles E. Merrill, the founder of the Merrill Lynch brokerage firm, saw an opportunity to consolidate the West Coast grocery industry. Towards this end, he purchased the 322-store Safeway chain of W.R.H. Weldon, who wished to exit retailing and concentrate on wholesale. Then, in June 1926, Merrill offered Skaggs either $7 million outright or $1.5 million plus 30,000 shares in the merged firm. Skaggs took the latter. On July 1, 1926, Safeway merged with the 673 stores from Skaggs United Stores of Idaho and Skaggs Cash Stores of California. On completion of the Skaggs/Safeway merger, M. B. Skaggs became the Chief Executive of the business. Two years later, Skaggs listed Safeway on the New York Stock Exchange. In the 1930s, Safeway introduced produce pricing by the pound, adding "sell by" dates on perishables, nutritional labeling, and some of the first parking lots. The merger instantly created the largest chain of grocery stores west of the Mississippi. In the 1930s, Charles E. Merrill temporarily left Merrill Lynch to help manage Safeway. At the time of the merger, the company was headquartered in Reno, Nevada. In 1929, it was relocated to a former grocery warehouse in Oakland, California. 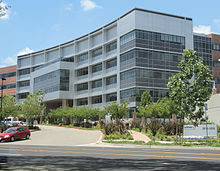 Safeway headquarters remained there until the move to Pleasanton, California in 1996. 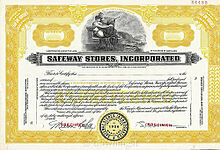 The initial public offering price of Safeway stock was $226 in 1927. A five for one split in 1928 brought the price down to under $50. Over the next few years, Charles Merrill, with financing supplied by Merrill Lynch, then began aggressively acquiring numerous regional grocery store chains for Safeway in a rollup strategy. Early acquisitions included significant parts of Piggly Wiggly chain as part of the breakup of that company by Merrill Lynch and Wall Street. Most transactions involved the swap of stock certificates, with little cash changing hands. Most acquired chains retained their own names until the mid-1930s. The number of stores peaked at 3,400 in 1932, when expansion ground to a halt. The Great Depression had finally impacted the chain, which began to focus on cost control. In addition, numerous smaller grocery stores were being replaced with larger supermarket stores. By 1933, the chain ranked second in the grocery industry behind The Great Atlantic & Pacific Tea Company and ahead of Kroger. In 1935, Safeway sold its nine stores in Honolulu, Hawaii "...because of the inconvenience of proper supervision." Also in 1935, independent groceries in California convinced the California legislature to enact a progressive tax on chain stores. Before the act took effect, Safeway filed a petition to have the law put to a referendum. In 1936, the California electorate voted to repeal the law. The company expanded into Canada in 1929 with 127 stores (which became Canada Safeway Limited and which was sold to Sobeys in 2013);  into the United Kingdom in 1962 (which became Safeway plc); into Australia in 1963 (which became Safeway Australia); and into Germany in 1964. The company also has operations in Saudi Arabia and Kuwait in a licensing and management agreement with the Tamimi Group during the 1980s. In 1981, it acquired 49% of Mexican retailer Casa Ley. A Marina Safeway in Hamilton, Montana built in 1962. This still keeps the Marina design, but the red letters have been replaced with the current logo. An older store design from the 1970s and 1980s is seen in this San Jose, California Safeway. In 1947, the company's sales exceeded $1 billion for the first time. By 1951, total sales had reached nearly $1.5 billion. The company adopted the S logo, which it still uses, in 1962. In 1955, Robert A. Magowan became Chairman of the Board of Safeway. Magowan had married Charles Merrill's daughter, Doris. Magowan also assumed the title of President in 1956. He remained President until 1968, and a member of the board until 1978. In 1966, Robert A Magowan brought his star Meat Processing Plant Manager, Michael F. Concannon to Oakland to become the Head of Meat Processing in North America. He retired in 1978 as well. Mike was instrumental in opening the Stockton plant, The Wichita plant and Meat Processing in Canada began in the 1970s. In 1959, Safeway opened its first store in the new state of Alaska—the first major food retailer to enter that market. The company opened three stores in Anchorage and one in Fairbanks over the next several years. The store in downtown Fairbanks was built on the site of a red-light district, known as The Line, which operated for close to a half century. Most of these stores were in buildings constructed by Anchorage real estate developer Wally Hickel, who later became governor of Alaska and U.S. Secretary of the Interior. In 1961, the company sold its New York operations to Finast. In 1963, Safeway again opened stores in Hawaii, having exited this market in 1934. It leased one store in Culver City to animator/filmmaker Don Bluth, who used it as a theater until 1967. In 1969, Safeway entered the Toronto market in Canada and the Houston market in Texas through opening new stores, rather than by acquisition. The firm ultimately failed against entrenched competition in both these markets. Following a hostile takeover bid from corporate raiders Herbert and Robert Haft, the chain was acquired by Kohlberg Kravis Roberts (KKR) acting as a white knight in 1986. With the assistance of KKR, the company was taken private and assumed tremendous debt. To pay off this debt, the company began selling off a large number of its operating divisions. 1987 Oklahoma 106 stores n/a MBO by management and Clayton & Dubilier forming Homeland (supermarket) Firm listed then goes into bankruptcy in 1996. Later it was bought by and became a subsidiary of Associated Wholesale Grocers. 1988 Kansas City 66 stores n/a Morgan Lewis Githens & Ahn/W S Acquisition Corp. Renamed Food Barn; bankruptcy 1994; stores sold to Associated Wholesale Grocers, which either closed or divested them to their members. 1987 Safeway Australia 135 stores $124m Woolworths Limited Australia Some stores continued to trade under Safeway name until 2008 (only within state of Victoria). All stores were gradually rebranded to Woolworths. The international stores were more successful for their acquirers. UK stores, Safeway plc, were sold to Argyll Foods, which itself was ultimately absorbed by Morrisons in 2004. Safeway Australia was sold to the Australian-based Woolworths Limited in 1985. Safeway sold its stores in Southern California, including those in established markets like Los Angeles and San Diego, to Vons in 1988 in exchange for a 30 percent interest in the company. Safeway also diminished operations in Fresno, Modesto, Stockton, and Sacramento. Save Mart Supermarkets purchased the few remaining Fresno Safeway stores in 1996. Many stores in the Eastern Division were also closed or sold in the 1987–1989 timeframe, including many recent additions in the DelMarVa Eastern Shore area. 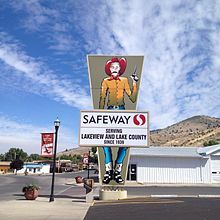 Safeway's national presence was now reduced to several western states and Northern California, plus the Washington, D.C. area. Altogether, nearly half the 2,200 stores in the chain were sold. The company was taken public again in 1990. Safeway Jordan was sold to the Masri family in 1991. In December 2003, the Masri family sold it to The Sultan Center of Kuwait. In the late 1990s, Safeway began to again aggressively acquire regional chains, including Randall's Food Markets in Texas, Carrs in Alaska, and Dominick's in Illinois. The buyout of Randall's marked Safeway's return to Texas ten years after the original stores in Houston were sold to AppleTree and several Dallas stores were sold to Tom Thumb, which was later acquired by Randall's. In 1997, after being a minority owner since 1988, Safeway exercised its option to acquire full control of Vons in Southern California. In 2001, Safeway acquired the family-owned Genuardi's chain, with locations in Pennsylvania, New Jersey, and Delaware. Safeway also created the subsidiary Blackhawk Network, a prepaid and payments network, a card-based financial solutions company, and a provider of third-party prepaid cards. In October 2003, members of the United Food and Commercial Workers at Vons stores in Southern California called a strike. The strike (and concurrent lockout at Albertsons and Ralphs) lasted until the end of February 2004. The largest Safeway built from the ground up in the United States is part of a mixed-use development in Mountain View, California. In 2012, the company dissolved the Genuardi's chain in suburban Philadelphia through a combination of store selloffs and closures. Giant acquired 15 of the chain's stores and made an offer for a 16th which was instead sold to a local chain as part of an antitrust settlement. Weis also bought three Genuardi's locations. A number of unprofitable Genuardi's units also had closed in 2010 and 2011 as their leases expired. Earlier, Zagara's, a small chain of upscale, gourmet supermarkets started by Genuardi's in 1990 was also shuttered in 2000, immediately following its parent company's acquisition by Safeway. The only Genuardi's in the northern half of New Jersey also closed soon after the merger with Safeway, and a location in Bensalem, Pennsylvania was sold to ShopRite in 2004. Genuardi's in Wilmington, Delaware, were converted to the Safeway name in 2004 due to legal issues stemming from a union contract signed by the management of early Safeway stores in Delaware that closed in 1982. The current Safeway locations in Delaware are served by division offices in the Baltimore–Washington metropolitan area, where Safeway has long been a major grocer. 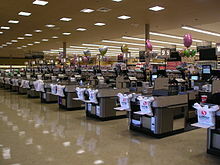 However, the majority of Safeway stores operate in the Western United States, where the chain originated. 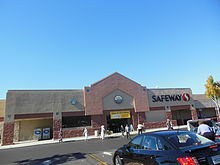 On September 7, 2016, it was announced that nine Albertsons stores in the Denver Metro area would be re-bannered as Safeway, as Safeway is the stronger brand in the Denver Area. The name change happened October 19, 2016. As of 2014, Safeway had a total of 1,335 stores in the United States and 195 in Mexico with its partnership with Casa Ley. The largest concentration of Safeway branches is in Washington with 168 stores and then Colorado with 115. Safeway store sign in Lakeview, Oregon. Omni Superstore (Northeast Illinois) – All locations closed or converted to Dominick's in 1998 after acquisition by Safeway. Andronico's (California), 1 closed & 4 converted to Safeway in April 2017. "Signature Select" is the company's signature private label that offers an everyday range of products. "Signature Reserve" is the companies private label for more upscale products.The label "Primo Taglio" is used for upscale deli products and "Lucerne" is the main dairy line for the company. In 2006, Safeway introduced an organically grown and processed line of products named "O Organics". A number of prepared dishes and soups are available under "Signature Cafe". After its acquisition by Albertsons, the combined company adopted Safeway's private label brand program, previously named "Safeway Select." Signature Select / Refreshe Brand Cola is produced by Cotts Beverages for Safeway Inc.; it is bottled in San Bernardino, California. Safeway Refreshe brand bottled water is bottled by Advanced H20, LLC in Stockton, California. Safeway closed its water bottling plant in downtown Los Angeles in January 2012. The launch included a redesigned logo, a new slogan "Ingredients for life" alongside a four-panel life icon to be used throughout stores and advertising, and a web application called "FoodFlex" to improve consumer nutrition. Many locations are being converted to the "Lifestyle" format. The new look was designed by Michigan-based PPC Design. In addition to the "inviting decor with warm ambiance and subdued lighting", the move required heavy redesign of store layout, new employee uniforms, sushi and olive bars, and the addition of in-store Starbucks kiosks (with cupholders on grocery carts). The change also involved differentiating the company from competitors with promotions based on the company's extensive loyalty card database. 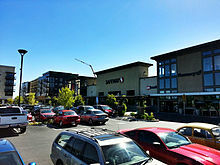 In 2007, the 1000th "Lifestyle" store was built in Everett, Washington. Safeway has tried a range of new store formats over the years, most of which have ultimately failed. The company also made a number of attempts to repurpose older, smaller store sites, opening Food Barn, a discount grocery outlet, and Liquor Barn, a discount liquor outlet, in the 1970s. Safeway also trialled Town House in Washington, D.C., small stores targeting apartment dwellers, and a gourmet store concept, Bon Appetit in San Francisco and Tiburon, California. The S Medallion (1946 – 1982) — The red "S" part was slightly thinned in the late 1950s, and remained that way through 1982. The Ribbon Leaf (1982–2006) — Safeway used this logo from 1982 to 2006. The red stylized "S" was still in the center. The Yin-Yang – Life logo (2006–present) — The stylized "S" is still located in the center of a red "tube TV screen-style" shape, but is now white. The Ribbon Leaf logo, 1982. The Medallion logo in tile, Photo taken July 2005. "Since We're Neighbors, Let's Be Friends" (1969–1979) was probably the first Safeway advertising campaign to make use of a singalong jingle. This slogan was used by the U.S. stores until July 16, 1979, when the "Everything" slogan was adopted. "Everything You Want from a Store and a Little Bit More" (1979 – December 1981) was the campaign launched on July 16, 1979, and was adopted, perhaps, to reflect the image of Safeway stores as "one stop shopping centers." This campaign was used through December 1981, although it was in use in the UK into the 1990s. "Today's Safeway: Where You Get a Little Bit More" (January 1982 – 1983) was the first Safeway ad campaign to make use of the company's new "ribbon leaf" logo. "I Work an Honest Day and I Want an Honest Deal" (1985–1987) and "America's favorite food store" tagline were used with this campaign through 1986, until the buyout and divestitures, which reduced the store count and made the "America's favorite" line inaccurate; it also featured a song.
" Nobody Does It Better" (1992 – late 1990s) — This campaign is unique for being adapted from a pop song. In this case, the song was a hit for Carly Simon in 1977. Simon sang it as the theme song to 1977's James Bond movie, The Spy Who Loved Me. The 1993 version used in the commercials was recorded by R&B Grammy Award-winning singer Patti Labelle. "Vons is Value" (mid-to-late 1990s) was used only for Vons stores in Southern California. This was the first Vons ad campaign since Safeway took over ownership of the chain. "Ours Is Bigger Than Yours" (mid-1990s), in reference to the expansion of produce departments in Northern California. "Ingredients for life" (2005 – present) This slogan is still used in TV ads & store signage for Safeway's Colorado / Wyoming stores. "It's Just Better" (2015–present) used by both Albertsons and Safeway as a combined company. The Safeway ATM Network, run for Safeway by Cardtronics, operates in Colorado, Oregon, Wyoming and Washington. Typically, one machine is located near the front of each store that has a ATM. Cirrus, Plus, Star, and NYCE are on the network. The network was started in late 1998 in Denver and was expanded to Wyoming, Washington, and Oregon. Safeway transitioned[ when?] from regional control of its product assortments to national category management, known as the Safeway Category Optimization Process (SCOP). With all dry grocery corporate buying done from Safeway's Pleasanton offices, it is said it will increase representation of manufacturers by experienced sales professionals with extensive product and category knowledge. Corporate produce buying offices are located in Phoenix, Arizona. This will mean consistency across the Safeway chain, meaning one could go into a store in Winnipeg or San Francisco and find the same products at the same price, as all negotiation is now done at the corporate level. Safeway music is provided by InStore Broadcasting Network. The satellite network also beams commercials and advertisements for Safeway products and brands that play intermittently with the music. ^ "Safeway Fact Book". Safeway. 2013. Retrieved 2013-12-16. ^ "Our-Story". Safeway. Archived from the original on May 3, 2015. Retrieved 2015-04-28. ^ "Safeway History". Groceteria.com. January 13, 2009. Retrieved July 18, 2018. ^ Perkins, Edwin J. (November 2006). Wall Street to main street: Charles Merrill and middle-class investors. Cambridge University Press. p. 111. ISBN 9780521027793. ^ "Safeway stock out tomorrow". Los Angeles Times. November 14, 1926. p. 17. (Subscription required (help)). Alternate Link via ProQuest. ^ "Denies Kroger-Safeway Merger". Wall Street Journal. October 1, 1929. p. 4. (Subscription required (help)). Alternate Link via ProQuest. ^ "Safeway Sells Hawaiian Stores". Wall Street Journal. January 28, 1935. p. 12. (Subscription required (help)). Alternate Link via ProQuest. ^ Foran, Max (1982). Calgary, Canada's frontier metropolis : an illustrated history. Windsor Publications. p. 296. ISBN 0-89781-055-4. Archived from the original on September 9, 2015. Retrieved October 22, 2013. ^ Pool v. City of Oakland, 42 Cal. 3d 1051 (1986). ^ Groves, Martha (August 30, 1988). "The Wait Is Over: Vons Acquires Safeway Stores". Los Angeles Times. ^ Johnson, Kelly (October 8, 2000). "Safeway motors up to sell gas in Roseville". Sacramento Business Journal. Retrieved 2014-01-21. ^ a b Sandoval, Greg (February 1, 2002). "Grocers make another go at home delivery". CNET. ^ Waters, Jennifer (July 18, 2007). "Safeway shares jump on rumor of Sears Holdings' buyout". MarketWatch. Retrieved 2014-01-21. ^ Vosburgh, Robert (July 25, 2011). "UNFI Signs Up Safeway". Supermarket News. Retrieved September 14, 2014. ^ Strauss, Marina & Ladurantaye, Steve (June 12, 2013). "Sobeys to buy Safeway in $5.8-billion deal". The Globe and Mail. Retrieved June 12, 2013. ^ "Sobeys completes purchase of Canada Safeway". CNW Group (Press release). November 4, 2013. ^ Wohl, Jessica (October 12, 2013). "Dominick's to be sold or closed as Safeway exits Chicago". The Christian Science Monitor. Reuters. Retrieved 2014-01-21. ^ Gallagher, Mari (October 14, 2013). "Why Dominick's sputtered out". Crain's Chicago Business. Retrieved 2014-01-21. ^ Channick, Robert (October 16, 2013). "Jewel to keep workers from 4 Dominick's stores it's acquiring". Chicago Tribune. Retrieved 2014-01-21. ^ Channick, Robert (December 28, 2013). "Final closing time for Dominick's on Saturday". Chicago Tribune. Retrieved 2014-01-21. ^ "Albertsons Owner to Buy Safeway for More than $9 Billion". NBC News. March 6, 2014. Retrieved 2014-05-10. ^ Li, Shan (December 26, 2014). "Haggen chain to buy 146 Vons, Pavilions, Albertsons, Safeway stores". Los Angeles Times. ^ "Albertsons, Safeway complete merger". Supermarket News. January 30, 2015. (Subscription required (help)). ^ "Safeway store coming to Altamonte Springs". Orlando Business Journal. January 11, 2016. ^ Hendee, Caitlin (September 7, 2016). "9 Denver-area Albertsons stores to become Safeway's". Denver Business Journal. ^ "Safeway - Our Brands". www.safeway.com. Retrieved 2019-02-13. ^ "Safeway ready to unveil new 'branding' campaign". Supermarket News. March 2005. Archived from the original on 2007-10-15 – via FindArticles. 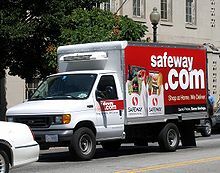 ^ "Safeway Grocery Delivery Service – Delivery Area Directory". Safeway. Archived from the original on 2012-02-13. ^ "Safeway's Super S Story". Pleasant Family Shopping (blog). September 16, 2007. Retrieved January 10, 2011. ^ Taylor, Michael (September 27, 2005). "John Benetti – Brentwood supermarket chain owner". San Francisco Chronicle. Retrieved 2015-11-01. ^ Runkle, Nathan (May 8, 2012). "Safeway Pledges to Eliminate Cruel Gestation Crates from Supply Chain". Mercy For Animals. Archived from the original on October 13, 2012. Retrieved September 2, 2012. ^ "General situation of world fish stocks" (PDF). United Nations Food and Agriculture Organization. Retrieved 2013-11-06. ^ Tremblay-Boyer, Laura; Gascuel, Didier & Pauly, Daniel (2009). "A global map of the relative impact of fishing on the biomass of marine ecosystems from 1950 to 2004". Ecopath 25 Years Conference Proceedings: Extended Abstracts. Eds. Maria Lourdes D. Palomares, et al. Vol. 17. Fisheries Centre Research Reports, 17. 2009. 132–133. Archived from the original on December 3, 2013. Retrieved 2013-11-06. ^ Radford, Phil (April 18, 2011). "Protecting our oceans, one supermarket at a time". The Seek Radio. Retrieved 2013-10-13. ^ "Carting Away the Oceans" (PDF). Greenpeace. June 2009. Retrieved 2013-07-20. ^ "Carting Away the Oceans 7" (PDF). Greenpeace. May 2013. Archived from the original (PDF) on October 21, 2013. Retrieved 2013-11-02. ^ "Parent Company Of Albertsons, Safeway, Other Grocery Stores Pledges To Source Only Cage-Free Eggs By 2025". Consumerist. March 1, 2016. Retrieved 2017-04-03. Wikimedia Commons has media related to Safeway Inc..